First person to walk on the moon inspires famous fans to sing his praises on Twitter. Astronaut Neil Armstrong inside the lunar module. Man's first landing on the moon occurred at 4: 17 p.m. on July 20, 1969. Armstrong passed away Saturday August 25, 2012. When legendary astronaut Neil Armstrong passed away Saturday at age 82, the responses from celebrities were out of this world. After all, who better to praise the moon walker than the stars? Each offered one small tweet for a man, one giant outpouring of love for a legend. Ryan Seacrest: "Thanks Neil Armstrong for bringing the moon into our living rooms &curiosity into our minds. One giant loss for mankind." Ashley Judd: How poetic that in the month of #NeilArmstrong passing, there will be a BlueMoon. George Takei: "With him, we all took one giant leap towards the heavens. 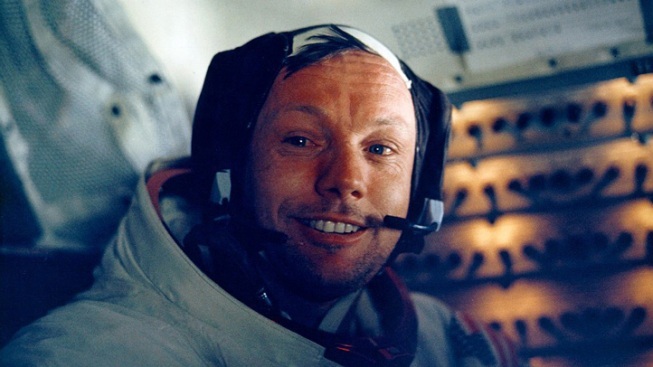 Rest in peace, Neil Armstrong, as you rejoin them. Mitt Romney: Neil Armstrong today takes his place in the hall of heroes. The moon will miss its first son of earth. Kevin Smith: "I salute you, NEIL ARMSTRONG! Thanks for your courage &class! You showed the galaxy how far a kid from Ohio could boldly go. #GoodNightMoon"
Josh Duhamel: "One of our greatest heroes died today. RIP Neil Armstrong"
Alyssa Milano: "Rest in peace, Neil Armstrong. You are such an inspiration." Simon Pegg: "Just heard Neil Armstrong took the giant leap. RIP a true modern hero and conqueror of the moon. Will be ever remembered." Bruce Boxleitner: "The greatest of American heroes has passed away, the first man to step on the moon 1969. Neil Armstrong, the eagle has landed. RIP"
Wil Wheaton: "One great moment of silence for mankind. Rest in peace, Neil Armstrong." Pee-wee Herman: Goodbye, Neil Armstrong - courageous pioneer and hero. Reba McEntire: My thoughts and prayers go out to the Neil Armstrong family. He was a super guy. 82 years old. Thanks for all you did for us, Neil!!! David Copperfield: He proved that the sky is no longer the limit. Every dream, no matter how big, starts with just one small step. A legend. Neil Armstrong. Al Roker: From Neil Armstrong's family: the next time you walk out on a clear night and see the moon smiling, think of Neil and give him a wink.